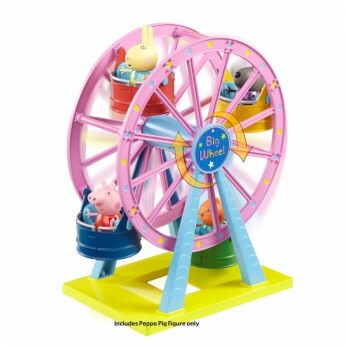 Enjoy a fun day out with your favourite character on this Peppa Pig Ferris Wheel. Slot Peppa and her friends into their seats and spin the ferris wheel for an exciting ride! This makes a lovely addition to your little one’s Peppa Pig collection. Exclusive theme park Peppa Pig figure supplied. Encourages imaginative play, peer interaction and hand to eye coordination. One supplied; Styles may vary; Size H27.5, W27, D15.5cm; For ages 3 years and over; EAN: 5029736046132. WARNING(S): Not suitable for children under 3 years old. This toy costs approximately £10.99 (for the latest and best prices make sure you check our retailer list for the Peppa Pig Ferris Wheel above). In our review of Peppa Pig Ferris Wheel we classed it as being suitable for ages 3 years, 4 years, 5 years but recommend you check the manufacturer specific advice before purchasing.